Marking pipes on ships and offshore sites is of the utmost importance to ensure safety at all times. Accidents, injuries and damage to machines and equipment can be caused by the fact your crew is unaware of the substances that flow through pipes. 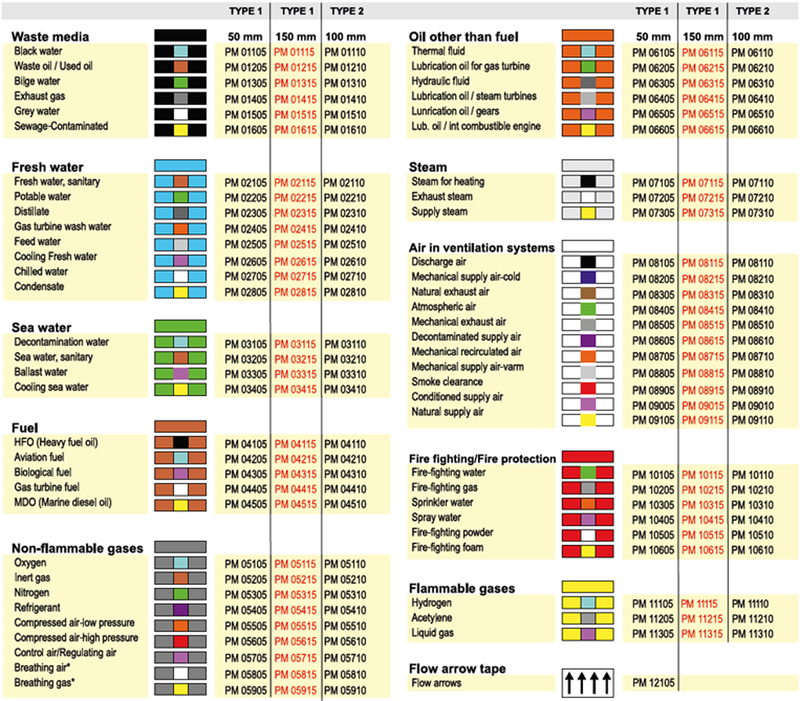 The ISO 14726 standard (International Standard Organization), specifies the principle colours for the identification of substances in pipes. Also, ISO 14726 specifies additional colour codes that allow a more detailed identification of the substance. How to install pipe marking? Arrows to indicate the directional flow are advisable. Additional Identification by usage of text will avoid any confusion regarding the substance transported through the piping. PolyesPro® Pipe Marking film is a high performance non-PVC polyester sandwich, manufactured according to 3M™ MCS™ (Matched Component System™) production specifications. Pipe marking Type 1 tape is a single colour tape which you need to combine to the correct colour coding. Also, a flow direction tape can be added to the combination to enhance identification. Pipe marking Type 2 tape is a multi colour tape which we can supply with or without flow direction and medium. Pipe marking Type 3 tape is a multi colour tape which we can supply with or without flow directions and medium. Also, it comes with a high gloss, laminated finish. T-ISS supplies various types of special pipe markers who can fullfill all customer demands on FPSO, Ferries, Cruiseliners, Tankers and other types of ships. Most importantly, we will make all markers using the colours according to the ISO 14726 regulation or the customer’s demands. We can deliver non-standard pipe markers with an Self-Adhesive layer, or Non-Adhesive. The non-adhesive pipe markers are called SnapOn Pipe Markers. The SnapOn Pipe Markers have the advantage that they are very quick to install, and you can remove and refit them on a different pipe. Also, they are ideal to fit oily or dirty pipes, since their snap-on feature doesn’t require them to stick to the pipe. T-ISS is official reseller of the special developed PolyesPro® pipeline markings. This product has a better temperature resistance, therefore a longer service life and improved colourfastness. The tape comes with all the usual 3M™ guarantees. For more specific information visit the official website of PolyesPro®. PolyesPro® pipeline markings are made out of two layers; a PVC free polyester base material with the image, finished with a protective laminate. As a result, the material is suitable for insulated pipes, painted pipes and stainless steel pipes. Any combination of lay-out is possible to produce, as well as integration of additional information such as pipeline numbers, etc. We manufacture the Pipe markings in accordance to all the international norms as well as your company standards. We supply the rolls in small dimensions for efficient and economical use.